Here at Custom Content Solutions, we take great pride in getting to know you on a deeper level before diving into your website content project. We take the time to gather the important details of your business, your goals for your new website copy and discover how to best use your voice to communicate with your target audience. Before we get started on your project, we conduct an in-depth website content interview call. To help you prepare, we’ve compiled a quick guide detailing what you can expect and questions you should consider before we begin. Before your interview, take some time to look over the following questions. If you have time, jot down some thoughts as you read over them. We’ll go over these in more detail during your interview. How do you sum up your services (i.e. what’s your elevator pitch)? Why do you do what you do? Put another way, why did you start your company? Who do you see as your competition in the marketplace? What is the most important service you provide to your clients? Who is your ideal client? Who do you serve? What challenges does your ideal client face (i.e., what drive them seek out your services)? What transformation are your clients seeking? What do they want life to look like for them after they have worked with you? How do you want them to feel after they’ve received your services? What is involved with this service? What are its features? Why would people want to come to you for this service? What can people expect from these services? What’s the most important message a prospective new client should hear before they even pick up the phone and call you about this service? For your interview, you’ll be joined by our Word Nerd Wrangler and one of our Creative Word Nerds (i.e., project manager and writer).  We’ll start by introducing ourselves and go over basic website information such as contact info and demographics. Once we’re ready to dig in, we’ll confirm your website’s sitemap—the pages your website will contain. Then we’ll define which pages we’ll write for you. From there, we’ll talk in detail about your business using questions like those offered above. We’ll wrap up our call by explaining what you can expect next, providing deliverable dates and any other information you may need. Gather a list of services and any other business information. If you have a lot of services, gather a list prior to our call. This helps us get down to business when discussing your offerings. Gather any other business information that might be helpful such as client testimonials, previous marketing materials, case studies, etc. Bring the right people to the interview. You want to involve key stakeholders in the interview, i.e., whoever has final say/approval over the content you publish on your website. But also be careful not to have too many people involved here. The adage, “Too many cooks in the kitchen…” absolutely fits here. Generally, this means two or three people: subject matter expert(s) and the final approver of content. Look for inspiration. Take a moment to look for websites that you like the sound of. These will help us lay out your content in the way you envision. Prepare by jotting down your answers to the questions above. It helps to have a roadmap of what you want to say prior to our call. We have a lot of ground to cover! Above all else, treat your website interview like you would the first meeting with a new client of your own. Prepare, but also come with an open mind. Be willing to go where the conversation takes us and allow yourself to be a bit vulnerable. This way, we can get to know the real you and use what we’ve learned for truly personalized copy. 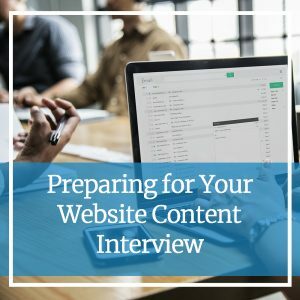 Already scheduled for a website interview? Great! We’re looking forward to speaking with you soon! Want to learn more about how to up your website content game? Give us a call today at 612-643-1824 or send us a message online.